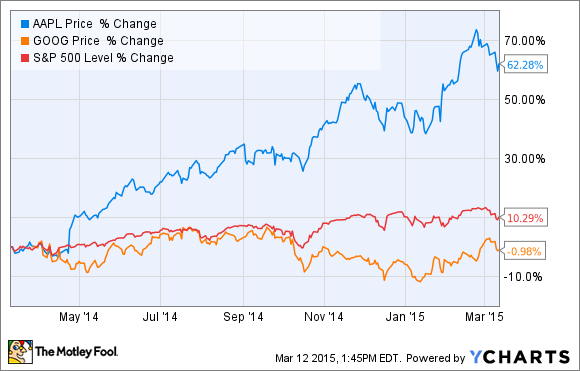 Is Google Stock a Better Buy Than Apple Inc. Today? As the analyst community rallies around Google, could it actually be a better buy today than tech rival Apple? As someone who looks at tech and telecom stocks on a daily basis, I've had potential problems at search giant Google (NASDAQ:GOOG) (NASDAQ:GOOGL) on my mind a lot lately. The chart below makes clear how badly Google has lagged both stocks in general and archrival Apple (NASDAQ:AAPL) over the last 12 months. However, successful value investing often requires finding opportunities in out-of-vogue areas of the market; going against the crowd and all that. And recently, a number of research analysts have made the case that Mr. Market clearly underappreciates Google. So between Google's stock market struggles and Apple's soaring shares, which stock appears the better buy today? Let's find out. With Google shares falling nearly 1% in the last year while the market as a whole continues to rise, no fewer than five of the largest research firms recently came to the company's defense. The primary theme that appears throughout each of these notes is that Google is a relative steal when compared to the market. The core argument boils down to Google remains a company with a far greater long-term growth outlook than the average business, but it's trading at a valuation roughly in line with major market indexes such as the S&P 500 or the tech-weighted Nasdaq 100. Sources: Yahoo! Finance, Nasdaq, and multpl.com. However, despite their relatively similar pricing, the average analyst estimates Google will grow at an annual rate of 11.9% over the next five years, versus a 7.7% total return for the S&P 500. Also, that's before backing out Google's huge cash hoard from its market capitalization. The most consistently discussed growth driver among these research notes is the increasing calls for Google to follow Apple's path and begin returning capital to shareholders via either stock buybacks or a once-unthinkable dividend. At the end of 2014, the search giant carried roughly $64 billion in cash and marketable securities on its balance sheet, versus slightly more than $3 billion in long-term debt. Google also generated over $22 billion in cash from operations last year, so virtually any financing needs should be amply covered (and then some). Moving beyond capital allocation, Wall Street sees a number of other potential catalysts the market doesn't in the near-to-medium term: realizing opportunities such as better monetizing its vast array of Google-owned mobile apps (Maps, Gmail, etc. ), making another large strategic acquisition akin to its YouTube buyout, improved mobile CPC, or even more far-flung initiatives akin to Google's recent small-scale entry into the U.S. wireless market. Obviously, there's a lot to distill into this relatively limited space here. However, hopefully you get the gist: These prominent analysts see a disconnect between Google's valuation and the many positives its business should enjoy in the years to come. Better buy: Google or Apple? I see many parallels between Google stock and Apple stock at the moment. In terms of pricing, neither stock is a screaming buy, but they're also certainly both attractive options relative to the market. To be clear, I have my concerns regarding Google and Apple. In fact, the timeline for my concerns for both stocks is eerily similar. For Apple, I'm confident its current iPhone super cycle has enough steam remaining to provide the company with impressive financial performance for the remainder of its fiscal 2015. However, with some lingering doubts about the market potential of the first generation of the Apple Watch, I worry Apple could suffer from some tremendously challenging comps in its next fiscal year. Although this is far from certain, I worry about a 2012-2013 sell-off scenario happening at Apple. Beyond the medium-term risk, though, I still believe in the Apple ecosystem and potential entry into new mass markets like the smarthome enough that I'm not losing too much sleep about that worst-case scenario. Similarly, I think it's pretty evident the market has taken an unnecessarily harsh view of Google of late. The main lingering concern I have is whether the company can eventually reverse its multiyear cost-per-click down cycle. However, like Apple, Google is so well-run, and so well-positioned at the epicenter of so many long-term growth markets, that it's hard to see things ending badly for those interested in the stock at its current levels. So while it might be a bit disappointing to be told there isn't necessarily a better option between the two at the moment, I'm at least of the mindset that both stocks appear attractive at their current levels.